Recycling waste water is a technique being used in a growing number of American cities. It has been used in Australia also. The Groundwater Replenishment System in Orange County California takes already-treated waste water from the sanitation district next door, puts it through a rigorous three-step cleaning process, and sends out water which then sits in a reservoir for 6 months. 70 millions gallons a day are recycled. The water first undergoes microfiltration to eradicate suspended solids, protozoa, bacteria, and some viruses. 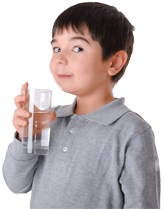 Second, it undergoes reverse osmosis – a process commonly used for filtering water for drinking by forcing it through a filter. Finally, high-intensity ultraviolet light combined with hydrogen peroxide destroys any remaining organic compounds. We wonder if this water has the trace elements that the human body needs, since reverse osmosis can eliminate them. Perhaps when the water is in the reservoir it is able to recover some trace elements. However, we do suspect that the water has been adequately cleaned of bacteria and the other natural concerns that municipalities test for. However, likely the final water still needs to be dechlorinated and defluoridated.